Ewald Dahlskog was a Swedish painter, glass artist and ceramist who was described as a workoholic by his friends. Already as a 14-year old, he started to participate in classes at art schools. He then conitued his education at the Royal Academy of Arts in Stockholm. Dahlskog was hired by Kosta in 1926. His first commission for Kosta was to create a new collection of glass for an exhibition at the Metropolitan Museum of NYC. His art deco glass with etched decors won the hearts of the critics but had less commercial success. Only after three years he left the glass industry and started to concentrate on ceramics for Bo Fajans in Gävle. He was a true pioneer as a ceramist. 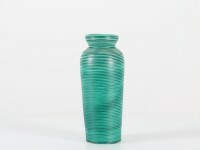 At the Stockholm Exhibition of 1930, Dahlskog presented a series of strictly carved vases and urns which were received very warmly by the critics. Ewald Dahlskog was the creative leader of Bo Fajans until his dead. Dahlskog is also famous for his woodwork and had numerous commissions with inlay work at theaters, concert halls and train stations, among which the boat "Stockholm" - the Swedish-America Line, counts as the most important. 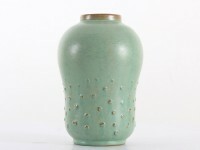 Scandinavian ceramic large gourd vase with relief dots by Ewald Dahlskog for Bo Fajans.